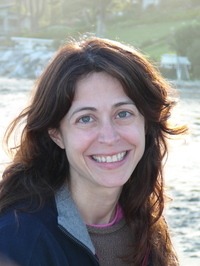 Claire grew up and went to school in Newton, Massachusetts, the youngest of 5 children. After graduating from Newton South High, she went to Harvard and later moved to LA. Her name during that time was Claire Scovell. In LA, she wrote for magazines including GQ, Vogue, and Cosmopolitan. She also met her husband there, a TV sitcom writer who writes for “The Simpsons”. In 1989, they got married and later had four children (Max, Johnny, Annie and Will). She currently lives in the Pacific Palisades with her family and too many pets to keep track of. She admits to being an agoraphobic who would rather hide in a corner somewhere hunched over her computer. So if you're hoping for her to come to a town near you you'll probably be waiting a very long time. Claire first came on to the literary scene back in 2003, when her first novel 'Same as It Never Was' hit the shelves. After having four children, Claire felt it was time to do something different and decided to write a book. The book is about a young college student whose father and step-mother die leaving her to be the guardian of her 3 year old half-sister. While learning how to take care of Celia, she discovers sometimes it's the unexpected things in life that turn out to be the best. The main character grows as a person and finds love along the way. It should also be noted that the book was later made into an ABC Family movie entitled, 'Hello Sister, Goodbye Life'. In 2006, she wrote 'Knitting under the Influence'. The book follows the lives of three very different woman who happen to be friends. One of their weekly rituals is to get together and knit while catching up with each others' lives and sharing advice and an occasional cocktail or two. Katherine is the sibling of a pair of famous twin movie stars. Sari works at a clinic with children who suffer from autism. Lucy works at a research facility as a lab assistant where animal testing is common. One of the fun things about this book is that in the back Claire has listed the recipes for several drinks with names such as Pink String Bikini, The Glittery Scarf, and The Cozy Brown Afghan. I'm curious if the drink on the cover could be The Tangled Skein? Oh, and if you're wondering Claire knits and is happy knitting is once again hip. In 2008, Claire wrote The Smart One and the Pretty One. The story deals with the story of two sisters, Ava and Lauren. Ava is the smart sister - she's a lawyer in a firm and never seems to have time for a social life. She's pretty much married to her job. Lauren, on the other hand, is the pretty one and is a bit of a party girl. She's outgoing and likeable, but has a problem with self restraint when it comes to shopping. Ava is attempting to help Lauren get out of financial ruin by making her come up with a plan and sign a legal document stating she won't buy anything new for a year unless it's absolutely necessary. When Lauren finds a marriage contract her parents and some family friends wrote for Ava and their friend's son, she can't help but think of killing two birds with one stone. She decides to track down the forgotten fiance and get revenge on her sister for making her sign a contract. One of the fun things Ms. LaZebnik included in the back of this book was a list of famous sisters. The list includes The March sisters from Little Woman, The Bouvier sisters, The Bronte sisters, and the Gorgon sisters. I must admit the last one surprised me. In 2010, Claire wrote, 'If You Lived Here, You'd Be Home Now'. This is a book about a single mom, Rickie, who lives with her parents. Rickie was on the college track, going to college when she got pregnant. She dropped out of school at the end of her freshman year to raise her son. Since then, she's kind of lost herself along the way. She's taken online courses, but still hasn't done much to improve her current situation. Her son suffers from celiac disease, an autoimmune disease in which the body can't process gluten. He's slightly smaller and less outgoing than most of the other kids in his class and not being able to eat most of the foods other kids can, makes him the target for bullying. In this one, both mother and child have problems fitting in and each has their own hurdles to overcome, but help comes from an unexpected source - the school's new PE coach. In August, Claire's book 'Epic Fail' was released. It's her first Young Adult book and is a loose rework of 'Pride & Prejudice'. While you may notice the similarities between the two books, I'm guessing the majority of people won't make the connection unless it's pointed out. The story is set in an exclusive LA high school. Elise and her family have just moved, and the story deals with fitting in to a new school and how first impressions can be deceiving. It shows how sometimes you need to let go of personal prejudices and look under the surface to really see the person inside. It should also be noted that she co-wrote two nonfiction books with Lynn Koegel - 'Overcoming Autism: Finding the Answers, Strategies and Hope That Can Transform a Child’s Life' (2005) and 'Growing up on the Spectrum: A guide to life, love and learning for young adults with autism and Asperger’s' (2010). Both books hold significant meaning for Ms. LaZebnik as she is a parent of an autistic child. Which finally leads us to Claire's most current book which will hit bookstores everywhere today, September 1st, 2011 - 'Families and Other Nonreturnable Gifts'. I have to admit when I saw the name of this book I was pretty sure I'd enjoy it. The fact I went on a Claire LaZebnik book reading spree attests to fact that I did. I love the witty banter and humor found in her books. When I reached the end of this one, I had to giggle as I read her essay entitled 'The Only Normal One'. This book was inspired by, of all things, the Munsters. Remember that long ago created TV series about a family of monsters and one beautiful blond 'normal' daughter that made you wonder if the stork messed up on his delivery? In 'Families and Other Nonreturnable Gifts', Keats (named after the poet) Sedlak, is the only 'normal' person in her family. Surrounded by a family of eccentric geniuses she's the one who stands out. She's been dating the same guy for 10 years and her family and boyfriend don't get along. In this book, Keats will discover some things about herself she hadn't known and reestablish some of the bonds with her families. Also, here is an interview I found of Claire LaZebnik after she published 'If You Lived Here, You'd Be Home Now'. It's divided into 2 parts. Enjoy! 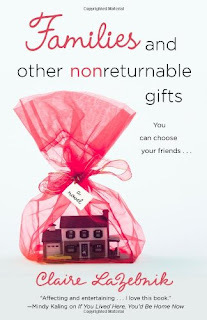 The publisher accidentally sent me an extra copy of Claire's book, 'Families and Other Nonreturnable Gifts'. Her error will be someone's gain. One person will win the extra copy. 4. Leave a comment about an embarrassing family moment. 5. You will automatically get an additional entry if you entered one of my previous giveaway and didn't win. Winner will be randomly chosen. Book will be sent directly from me. Giveaway ends September 8th, midnight eastern time. Winner will be posted on my blog and notified by email or message posted to them via Goodreads. Winner will have 72 hours to respond before another winner will be selected. Good Luck! Note: All the above information about Ms. LaZebnik was taken from her website, the back of her books (yes, I usually read cover to cover), and her publisher. I guess you could call it an embarrassing moment, although not for me, when my inlaws invited themselves to our house on my birthday and didn't know it was my birthday - after 10 years of being in the family.